In this episode, Max Keiser and Stacy Herbert look at the the central bank revolution that will end in disaster with Japan leading the way after voters have demanded even more aggression with the nation's monetary policy. They also look at Moody's ratings getting no respect because nobody has done better than flipping a coin for 50 years in a slow burning prison. 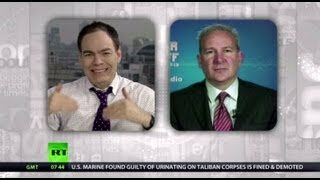 In the second half, Max Keiser talks to Peter Schiff about bonds, dollars and governments buying their own debt. Related posts: Jim Rogers on the Keiser Report Dumb Luck, Wash Trading & Gold Suppression; Peter Schiff Report – Dow 14,000: What Does It Mean? Keiser Report Meets Schiff Report 4.0 E276. Video Link : Embed : Advertisement. Populer Artist. ... Keiser Report Crazyflation E383 Ft. Peter Schiff Video Clip. Is This What A Bursting Bubble Looks Like? Peter Schiff: We Will Never Pay It Back, We Can't Pay It Back, That's Why We Raise The Debt Ceiling! Peter Schiff 2012 - Talking about Silver: A "Perfect Storm" for the metals!